The ImmersionRC Vortex 250 Pro FPV Race Quad Stage 1 Kit upgrades the standard Vortex 250 Pro to the specification of the ones which were raced in the Dubai World Drone Prix. The ImmersionRC Vortex Pro's were all equipped with the new Race kit, the race kit stage 1 drops a critical 40 grams from the 250 Pro's stock configuration. This weight loss is achieved using titanium screw sets, they are lighter than steel, and much stronger than aluminium (supplied in the V25PUPGLT1 stage 1 race kit there are 46 titanium screws included). The arms are have a reduced thickness from the standard 4mm to 3mm. The race kit parts are lighter than the stock parts, however they are still strong enough for the racetrack. 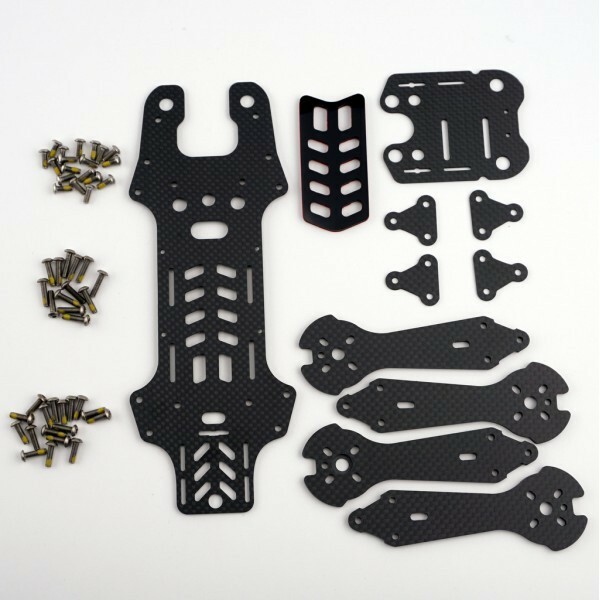 The replacement top plate, and camera mounting plate are also included, dropping from 2mm, to 1.5mm 3K Carbon Fiber.